The mountain beaver species of western North America possess some seriously weird teeth. Their teeth are thick and deep, providing the extra toughness necessary to eat hard, gritty plants. So why do they spend all their time eating soft plants? While the mountain beaver sounds like it's probably a beaver of some sort - one that lives on a mountain of some sort, perhaps - it's actually an unrelated species of rodent. In fact, it's considered the most primitive rodent species still in existence, earning it the dreaded "living fossil" label. This basically means its present features have remained largely unchanged for millions of years - and it's just that feature that has baffled biologists. It all goes back to those teeth. The mountain beavers have hypsodonty, meaning their teeth are high crowned and extend way past the gum line. This, along with the extra thickness of the teeth, provides a lot of room for extra wear and tear. It's a feature that cows and horses have evolved to deal with the relatively gritty, fibrous material - grass, basically - that they usually eat. The problem is that mountain beavers don't eat anything like that. Now Samantha Hopkins of the University of Oregon has the answer. The mountain beavers don't need those teeth now, but they did about 10 to 15 million years ago, which is when these teeth features first appear in the fossil record. 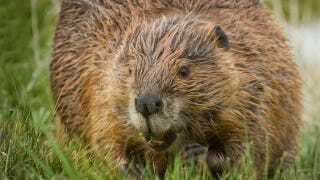 During that span, the volcanoes in the Yellowstone hotspot and Columbia River Basalts had frequent minor eruptions, spewing out huge swathes of volcanic dust that blanketed the mountain beavers' habitat. This unexpected volcanic seasoning turned a bunch of soft plants into gritty chunks of silicon. The mountain beavers had to basically eat their way out of this volcanic age, and they developed suitably thick teeth to survive. What's particularly remarkable is how isolated this effect was - while the mountain beavers in the northwestern United States and Canada had to develop these hypsodont teeth, their counterparts just a hundred miles away in the Sierra Nevada had no such need. There were still volcanoes down there, but they apparently didn't reach teeth-changing levels of intensity. Via New Scientist. Image by Bill Smith, via Shutterstock.